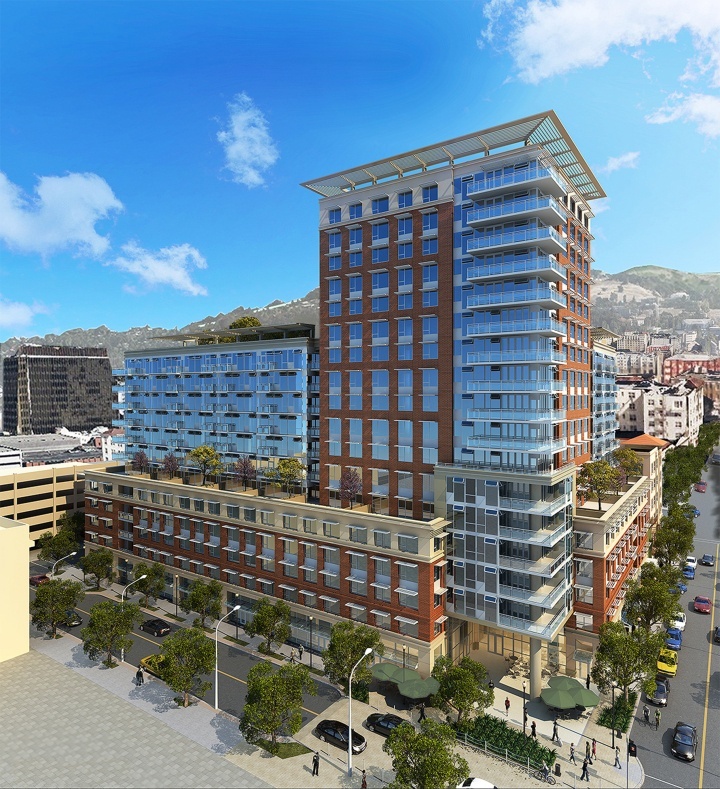 In a recent article for Berkeleyside titled "High-rise developer in Berkeley to use 100% union labor," author Emilie Raguso wrote about a planned high-rise project in downtown Berkeley, CA that has an agreement in place to use 100% union labor for the construction. This would be the "first agreement of its kind in Berkeley — between a private developer and labor — in at least 17 years." One of the other interesting features of the proposed building project is the inclusion of green and transportation-oriented components. One of those planned features is a TransitScreen SmartWalk digital display projected outside the lobby of the building, providing real-time transit information as well as wayfinding directions to nearby local landmarks. Though the union agreement is “the centerpiece” for the Harold Way project, “and the thing we’re most proud of,” the team has also committed to other significant community benefits, which are required under the Berkeley Downtown Area Plan. Developers have the flexibility under the plan to determine exactly what benefits to offer. In this case, HSR has committed to bring back six state-of-the art movie theaters to the site in partnership with Landmark’s Shattuck Cinemas; create a public plaza at the building entrance at Harold Way and Kittredge Street; and include an expansive program of green- and transit-oriented features, such as two transit passes per unit (twice the number required under the code), cargo bike and shopping cart access for residents, bike fix stations, EV charging stations, electric bikes to rent and more. In addition, a “SmartWalk transit screen” is planned that would project real-time transit and navigation information onto the pavement for passing pedestrians.